Our granular activated carbon (GAC) adsorption remediation systems remove organic and metal contaminants caused by past industrial pollution and other sources. TIGG’s groundwater remediation treatment equipment has been used by remediation companies for nearly 40 years. Our groundwater GAC adsorption remediation systems remove organic and metal contaminants caused by past industrial pollution and other sources. Scientific research has shown that granular activated carbon filtration systems are effective for removing PFOA and PFOS contaminants from groundwater. These fluorinated, organic contaminants are two perfluorinated compounds, also known as PFCs. PFOA and PFOS are considered emerging contaminants, and their environmental impact is now reported in soil, air, and groundwater. For more information visit our PFC page. TIGG’s cost-effective and reliable rental groundwater remediation equipment is ideal for short-term rentals and long-term projects. We can also custom-design fully integrated systems to meet your specific treatment objectives. Our large, in-stock groundwater treatment equipment inventory includes activated carbon adsorption vessels, GAC remediation drums, activated carbon towers, bag filters, cartridge filters, oil water separators, and water pumps. We have various types of activated carbon and other media to fit your specific purpose. TIGG carries a wide variety of activated carbon, resins, metals-removal media, and other filtration media. CANSORB P liquid phase activated carbon adsorption vessel is particularly adept at groundwater remediation. Our engineers will work with you to design an efficient system and ensure you have the right equipment for the job. Visit the CANSORB P page for detailed drawings, flow rates, and other important information. When looking for dependable groundwater remediation performance on a smaller scale, many remediation companies turn to TIGG’s ECONO L Drum. Competitively priced, these activated carbon groundwater adsorption drums are constructed of polyethylene with a closed head. When an experienced environmental remediation company secured a contract to clean up a former manufactured gas plant in a New York community, the contractor realized the environmental remediation process would require a host of different technologies to address contaminated soil as well as ground and surface water. 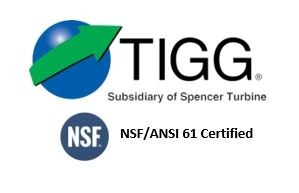 TIGG was called upon to provide a solution for treating the contact water because of its ability to meet the company’s requirements of reasonable pricing, immediate rental equipment availability and technical expertise. TIGG helped rescue the project, which initially employed one of its competitors who provided inadequate engineering and a solution that was not meeting treatment objectives. When the Port Authority of New York and New Jersey were required to treat groundwater containing jet fuel at the Newark Airport, they contracted with Compass Environmental of Chicago, Illinois, to provide and operate a pump and treat system. 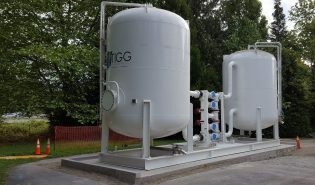 Compass in turn selected TIGG as its subcontractor to design and supply a groundwater treatment system enclosed in a heated, insulated trailer so that it could be moved to other locations, as needed. The 25 gpm treatment system had to meet the NJ Effluent ‘Standard for Site Remediation Projects’ and be operable during the winter months without freezing. A customer needed a temporary 50 gpm treatment system onsite in three week for treatment of groundwater contaminated with chlorinated hydrocarbons. TIGG was able to design, fabricate, and deliver a trailer-mounted groundwater treatment system on time. The system had to be capable of removing the chlorinated hydrocarbons to ppb levels. Contaminated groundwater resulting from a failed underground storage tank needed to be treated. TIGG provided three custom designed vessels, each containing 2,000 pounds of a special media to remove MTBE at a rate of 25 gpm. TIGG also provided the media change out, disposal and replacement services. Wastewater needed to be treated to remove particulates, oil, hydrocarbons, and lead. TIGG provided a system including a bag filter, a vessel containing OMC for oil removal, two vessels operating in series containing carbon for removal of hydrocarbons, and drums containing a special media for removal of the lead.